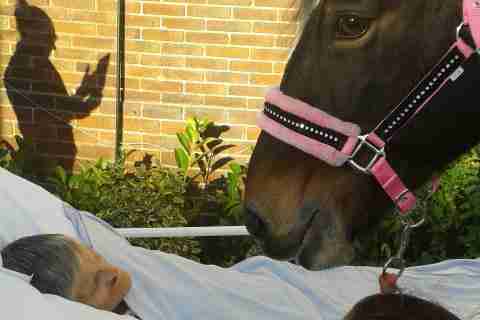 A terminally ill woman in England was granted her dying wish early last week - meeting with her beloved horse, Bowden, whom she raised from foal, for one final farewell. A touching photo of the reunion capturing the profound bonds of love shared between people and animals spread quickly across social media in the U.K. 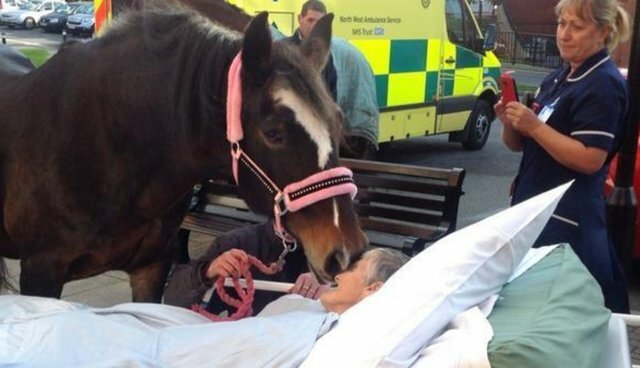 Sadly, Sheila Marsh, a lifelong animal-lover, passed away shortly after caregivers from Royal Albert Edward Infirmary in Wigan were able to fulfill her last request, the Manchester Evening News reports. But according to her family, Marsh had taken comfort in her visit with Bowden, who nuzzled her as she lay unable to move in the final hours of her life. "It is absolutely right that we should pull out all the stops to ensure that our patients and their families receive personalised, compassionate and dignified care at the end of their life and this is what we will always strive to achieve."